So you have decided to try some tongkat ali. But before buying, some important decisions are to be made. Do you want tongkat ali roots, or do you want tongkat ali extract? If you buy roots, the cost of shipping will be much higher than the roots themselves. Brewing your own tea will also be time-consuming. If you want extract, you first have to decide whether you want genuine tongkat ali or fake tongkat ali? Unfortunately, more than 90 percent of all tongkat ali extract on the market is simply fake. 1. those that are any root powder or plant, mostly tribulus terrestris. These simply have no effect at all. 2. powders laced with sildenafil analogues, often at high dosages. These have an effect, just like Viagra has. But it's not the hormonal effect of tongkat ali. It's an effect of sildenafil, tadalafil, or vardenafil. And unfortunately, these fakes regularly kill users. Tongkat ali is a root, and as such, it consists mostly of cellulose. Cellulose is not a pharmacologically active substance. The pharmacologically active ingredients only form a very small part of the root. The raw root, whether powdered or chipped, is not fit for human consumption. This is not just the case because humans cannot digest cellulose but also because the raw root often is infested with fungi and bacteria, some of which are harmful. This is absolutely normal for anything that grows underground. Is there anything humans would pull out of the soil and consume uncooked? Raw root powder is commonly sold in Malaysia as well as in the US, both in brick-and-mortar shops and by Internet retailers. There is, of course, nothing wrong with root powder or chipped root, as long as you know how to handle it. If you do not buy a ready-made extract, you have to prepare the root powder or chipped root as your own extract. This can be a liquid extract or a dry one. If you prepare a liquid extract, you will have to consume a lot of fluid to get a proper dosage. Producing your own dry extract will take a lot of time. Root powder in capsules is nonsense because one should not ingest raw tongkat ali root, even not if it is packaged in gelatin capsules. The most likely effect of ingesting raw root powder is diarrhea, caused by salmonella bacteria. And if you are unlucky, you get a strain that causes typhoid fever. Tongkat ali is so bitter, and tastes so lousy, that the only way one can ingest a proper dosage is to get it down as quickly as possible. Capsules of dried tongkat ali extract are a good solution because extract is concentrated, and you can swallow the tongkat ali without tasting it. The only problem with dried extract in capsules is that you are easily cheated. It is very difficult to check yourself whether you actually get tongkat ali extract, or just tongkat ali root powder, or something else altogether. Tongkat ali root has to be boiled, and before being boiled. Use about half a liter of water for 50 gram of root powder or chipped root. 50 gram of root powder or chipped root will yield about 2 normal dosages, or a single dosage for an experienced user or a bodybuilding athlete. I know what I’m talking about because I did make my own extract. I did so because I am a suspicious character, and so that I could write about it. I used 500 gram of chipped root, soaked in 5 liter of water for 24 hours. I brought the whole thing to a boil, and then filtered the water. I then left the 5 liters of water for almost 2 days on an electric stove with heat control (about 50 centigrade) until I got a thick sap. I further heated the sap in an electric oven (about 40 centigrade) and then got a rather hard crust. Working this crust through an electric coffee mill, I ended up with about 10 gram of powdered extract. Which means: an extract of the strength 1:50. 10 dosages out of 500 gram. I discussed this extraction process with two German pharmacists and the assistants of a plant analytical laboratory of a university. They all assured me that mine has been a proper extraction process. There isn’t much technology to preparing water-based extracts. The solvent has to be water, and just water, otherwise the result would not be an aqueous (water) extract. In proper extracting facilities, they have integrated machines that speed up the evaporation by doing it under high pressure, or by other means. Some companies that sell such evaporating equipment have patents on these machines. But if a website claims that they have patented the extraction by water of tongkat ali, then that’s bulls. They just want you to believe that their extract is special (so that you won’t buy somewhere else), and that it justifies an inflated price. Tongkat ali has been researched well, though not in full. But one thing is certain: the traditional use is as an aqueous extract (extraction by water, as in tea or coffee), and that way, it has been used in Southeast Asia for hundreds of years. Other extraction possibilities would be by ethanol (alcohol) or chloroform, and a plethora of other chemical solvents. But such extracts have only been tested recently, and only one thing is clear: their LD50 values are much worse than those for aqueous extract. I would not experiment with tongkat ali extracts in which the solvent has been anything but water. Extract strength is another critical topic. I know from my own experiments that 100 grams of root yield a dried extract of 2 gram. So, 1:50 seems to be genuine strength of an aqueous extract. Of course, 1:100 sounds much sexier. But who is to check on such claims? Even if a new trader should decide to proclaim that his extract is 1:1000, who is going to examine whether the claim is true? A 1:100 extract, or one that is proclaimed to be 1:1000, doesn’t necessarily contain more active ingredients. In order to turn a 1:50 extract into one that is 1:100, I really just have to discard half of the 1:50 extract. I can do so by passing it through a smaller mesh, which will just remove the coarser part of the ground crust I got from drying the aqueous extract. Thus, turning a 1:50 extract into a 1:100 extract means just that they sell half the extract, probably for double the price. It says NOTHING about the efficacy of the extract. Furthermore, there are justified suspicions that what is sold as 1:100 extract may only be root powder. I have seen documents on the FDA website (www.fda.gov) that show that people marketing 1:100 extract capsules have just applied for a registration of tongkat ali powder in capsule form, not of extract in capsules. To see these documents on www.fda.gov, please use their search engine and enter the search term “eurycoma”. The scientific, Latin name of tongkat ali is eurycoma longifolia, and official documents deal with the plant under this name. Do not search for “tongkat ali”, as this will not get you to the FDA correspondence about the product which is sold as 1:100. A search for the combined name, “eurycoma longifolia”, doesn’t seem to work well on the FDA site. It is best to just search for “eurycoma” only. I also cannot recommend purchasing from Internet spam sites. Their expertise is not tongkat ali but Internet marketing. They know how to force their own site(s) to the top of search engine rankings, and then hunt sales commissions from the manufacturers whose products they promote. This is why the information they provide is not their own but just taken from other sites (like mine) and then more or less reworded. 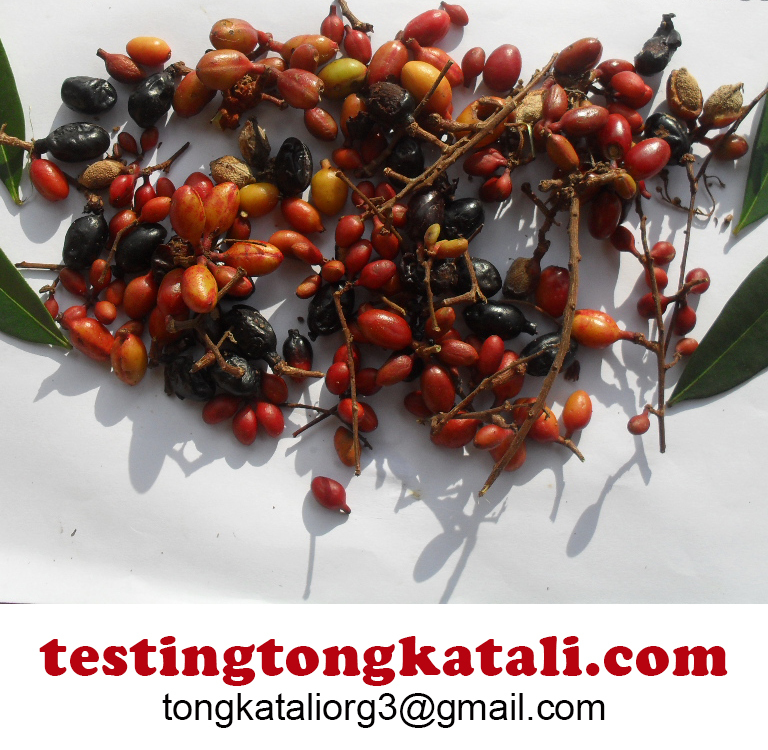 I believe that it makes sense to buy tongkat ali or tongkat ali extract at the origin. From a company whose product is tongkat ali, and not from a company whose product is Internet marketing, and who will sell any merchandise for which they can get a high search engine ranking.